We always appreciate feedback from our customers but we especially enjoy receiving thanks for a job well done! 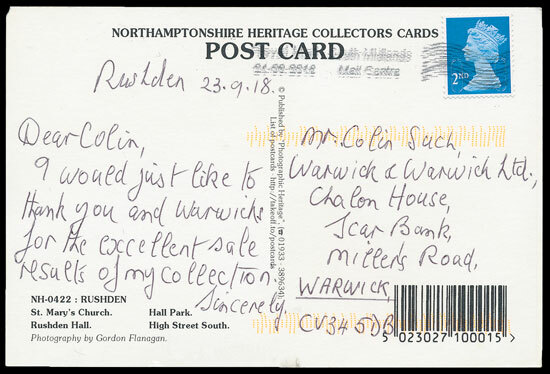 This happy customer from Rushden, who sold his postcard collection through one of our specialist auctions, chose to show his appreciation via a very appropriate method… on a postcard! Or if you are thinking of adding to you collection, our full auction catalogues are available to view on our website, which also has details on how you can place bids. Our Twitter and Facebook accounts also include updates of all our latest auction news.